Mondrian’s last chrysanthemum, the Colin McCahon painting we bought at the end of last year, arrived at Te Papa recently. It’s great to see it again. Like most paintings, there’s a lot about this work that you don’t get until you see it in the flesh. There’s beauty of the painting itself, its amazing combination of subtlety and urgency. There’s the disarmingly simple composition — a Mondrian abstract rendered as an apocalyptic landscape. There’s also the fact that buried in the scumbled black square is the ghostly trace of the word ‘ash’. It’s there, in the shadows, that the meaning of Mondrian’s last chrysanthemum reveals itself. 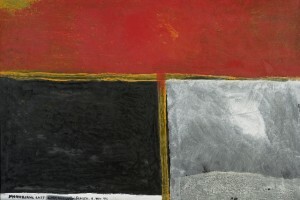 The threat of nuclear war was a subject that preoccupied McCahon, as for example in Te Papa’s The Second Gate Series. The word ‘ash’ in Mondrian’s last chrysanthemum calls to mind President Kennedy’s famous speech during the 1962 Cuban missile crisis, in which he spoke of ‘the costs of worldwide nuclear war in which even the fruits of victory would be ashes in our mouth’. Mondrian, it seemed to me, came up in this century as a great barrier — the painting to END all painting. As a painter, how do you get around either a Michelangelo or a Mondrian. It seems that the only way is not more ‘masking-tape’ but more involvement in the human situation. I think what he meant by this was that art needed to have a message. Abstraction by itself wasn’t enough, and beauty without purpose was empty. ‘Painting’, he wrote, ‘can be a potent way of talking’. Mondrian’s last chrysanthemum is a painting that has a lot to say.